A mouse study published in JNeurosci finds that restricting food availability to one half of the day resets the normal timing of the signals that regulate food intake and reduces weight gain in mice fed a high-fat diet.These findings could inform future obesity research in humans. Nerve fibers in the stomach communicate to the brain on the amount of food in the stomach. This leads to feelings of fullness and satiety after a meal. The sensitivity of the receptors that regulate this process fluctuates throughout the day in order to coordinate food intake to energy requirements. In rodents, which are nocturnal, the sensitivity of these receptors is lowest during their nighttime active period when energy demands are highest. Previous research that found the normal timing of these signals disappears in mice that become obese from eating a high-fat diet. 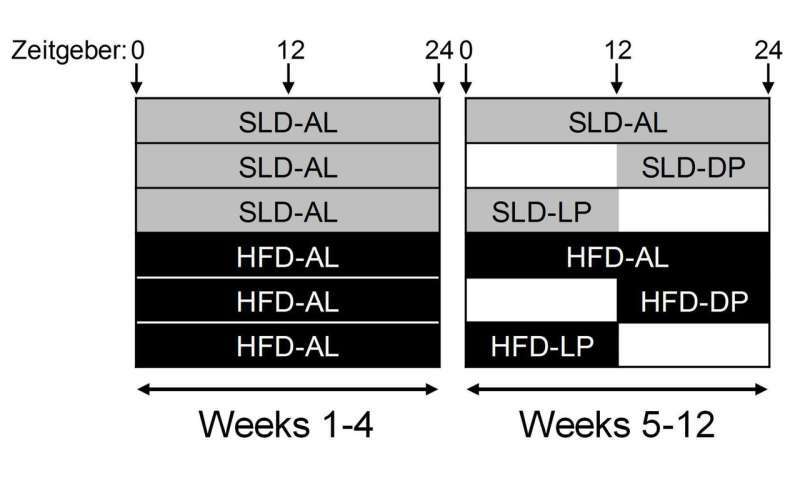 Building on previous research and demonstrating positive outcomes in obese mice fed only during the dark period, Amanda Page and colleagues found that time restricted feeding prevented the loss of satiety signaling in mice fed a high-fat diet. These mice gained less weight than mice that had unrestricted access to the same diet.